On July 5, 1969, the Rolling Stones hosted their iconic free concert in London`s Hyde Park. For the Rolling Stones, 1969 represented a major time of transition. Though Brian Jones founded the band, various personal troubles led to his estrangement from the others, and they fired Jones on June 8, 1969. The remaining four Stones brought in new guitarist Mick Taylor to finish the recording of Let It Bleed and embark on a tour. Jones apparently planned to start his own new musical enterprise, but instead, he died on July 3, less than a month after his departure from the Stones. The Stones already planned to play a massive free concert in London on July 5, an event intended to act as Taylor’s introduction to the public as well as the band’s first live performance in more than two years, an eternity at that time. Jones’s death obviously changed the tenor of the day and turned a celebration into a memorial. We visit the July 1969 concert via Hyde Park Live 1969. While other releases in the Stones’ “From the Vault” series have focused on video debuts, this one reproduces The Stones in the Park, a documentary that originally aired on TV in 1969 and has seen a variety of issues over the years. Hyde Park presents eight of the concert’s 14 songs. The then-unreleased Let It Bleed provides “Midnight Rambler” and “Love In Vain”, and we get the 1969 single “Honky Tonk Women”. 1968’s Beggars Banquet brings us “Sympathy for the Devil” and we also find that year’s single “Jumping Jack Flash”. 1965’s classic single “(I Can’t Get No) Satisfaction” pops up, and we receive “I’m Free” from 1965’s Out of Our Heads. The documentary’s set ends with a cover of Johnny Winter’s “I'm Yours & I'm Hers”. As noted, we lose six songs from the original concert: “No Expectations”, “Mercy Mercy”, “Stray Cat Blues”, “Down Home Girl”, “Give Me A Little Drink” and “Street Fighting Man”. We also fail to get complete versions of some of the tunes included here. For instance, “Midnight Rambler” opens the documentary, but we find the track already about halfway over when we hear it. This continues for a while, though “Part 3” of Hyde Park delivers some more complete performances. We get long takes of “Honky Tonk Women”, “Love in Vain” and “Sympathy for the Devil”. The presence of truncated versions harms the rest of the piece, but at least it ends on a high note. Well, unless you consider the actual quality of the band’s performances, that is. As I already mentioned, Hyde Park brings us a band in transition, and they sound like it. Even in the best of circumstances, the Stones can be rough, so at a high-pressure gig with a new guitarist after a long lay-off, the Stones showed definite growing pains. Not that I think this becomes a bad performance, as it occasionally comes to life. It’s just iffy too much of the time, with too many mistakes and too much disconnect between the musicians. As the excellent live album Get Yer Ya-Ya’s Out would prove, the Stones would get their act together during the 1969 US tour, but they were a work in progress in July of that year. Hyde Park acts more as a documentary than as a concert film much of the time. We see some of the preparations for the show and meet the Hell’s Angels who acted as security. We also get some interview snippets with Mick Jagger and other behind the scenes elements. Oh, and we see hippies – lots and lots of hippies. At times, Hyde Park feels like a long reel of stoners as they dance badly. Man, no one ever looked as ridiculous “rocking out” as hippies, and Hyde Park repeatedly makes this clear. Those moments can be entertaining, but the rest of the non-concert segments seem somewhat tedious. In his interviews, Jagger doesn’t tell us much, and we don’t get a great feel for the staging of the concert. Ultimately, Hyde Park becomes a moderately unsatisfying hodge-podge. It chops out too much music to succeed as a concert film, and it lacks the insight or depth to be a good documentary. As a major Stones fan, I’ll keep it for archival reasons, but it doesn’t seem like something I’ll often revisit. 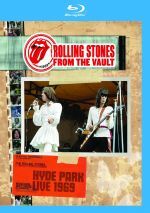 The Rolling Stones: Hyde Park Live 1969 appears in an aspect ratio of approximately 1.33:1 on this Blu-ray Disc. The visuals showed their age. Sharpness was a persistent issue. While the program usually delivered decent delineation, it never looked especially crisp, and it could often come across as somewhat soft and tentative. Jagged edges and moiré effects demonstrated no concerns, and I also witnessed no signs of edge enhancement. The image could be somewhat blocky at times. For the most part, print flaws seemed fairly modest. The image consistently showed moderate amounts of grain, but that simply reflected the original photography. Gate hairs were the biggest distraction, and some shots demonstrated a few specks, but those weren’t a frequent concern. Colors looked bland, as most of the film appeared mediocre in regard to color reproduction. The tones seemed somewhat lackluster and lifeless. Black levels also came across as a bit flat and muddy, and shadow detail seemed ordinary. Given its roots, this wasn’t a bad image, but it had enough problems to end up as a “C-“. When I examined the DTS-HD MA 5.1 audio of Hyde Park, I thought it worked pretty well. Concert scenes showed good stereo separation and spread, with ambient and crowd noises spread to the rear speakers as well. The soundscape went with a pretty standard “concert mix”, and that seemed appropriate. For the most part, audio quality was good. Jagger’s vocals could be a bit distorted at times, but they usually came across as reasonably clear. The instrumentation seemed solid, as guitars, bass and drums all showed nice clarity and range. I liked this mix. Only one extra shows up here: a booklet. This includes photos and archival elements as well as an essay from Richard Havers. It offers a nice piece of work. For historical purposes, The Rolling Stones: Hyde Park Live 1969 proves worthwhile. Unfortunately, it doesn’t offer an especially good document of an important gig, as it leaves out way too much music to satisfy. The Blu-ray provides good audio but visuals seem flawed and the set lacks notable supplements. As a Stones fan, I’m happy to own Hyde Park, but I think it will appeal mostly to other diehards.